Cloud Hosting Canada - FREE Cloud Web Hosting Canada - Free Canadian Cloud Web Hosting in Calgary, Alberta, Canada! Sites are way more SECURE & load twice as FAST! FREE with any web hosting plan! There is no denying the fact that one of the most imperative concerns of website owners is how to enhance the speed of their websites and make its loading time as effective as possible. In addition, there are instances when a website faces security problems, which may bring about DDOS attacks, or SQL injections, or hacking. SKGOLD® Hosting knows how essential it is for your website to have a fast loading performance, and secured transaction that will benefit you and your potential customers. That is why SKGOLD® Hosting has now included CloudFlare service, which will enable you to apply different techniques to speed up your website’s performance and secure it at the best way possible. CloudFlare service comes with many features and tools to ensure your website is fast and secure. CloudFlare CDN (Content Delivery Network) - Speeding up website performance by distributing your content around the world from the servers that are closer to your visitors. CloudFlare content optimizer - Automatically optimizes your website pages to minimize the number of network connections and ensure even pages with third party widgets load fast on both computers and mobile devices. CloudFlare security service - It is ideal in preventing the acquisition of DDOS attacks, SQL injections, hackers and spammers through its faultless security options. Furthermore, it obstructs all the probable threats and malware that can steal information from your website and ominously affect your bandwidth and website performance. CloudFlare analytics service - It provides insight into all of your website's traffic that you cannot receive from any other analytical programs, including search engine crawlers and threats. 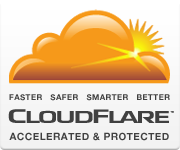 SKGOLD® Hosting is happy to bring the CloudFlare service to you absolutely FREE or charge. And it’s so completely simple to set up, you’ll want to do it tonight – in fact, you might want to do it right now. Just login to your cPanel (webhosting control panel), click on the CloudFlare icon under the "Software/Services" section, provide your contact email address and click the "Signup Now" button. Put the CloudFlare FREE services to work on your website, and you (and your visitors) will be forever grateful! Sign Up for your Cloud Web Hosting TODAY! Your Cloud Enabled website will be placed on green servers to protect the world environment. Get 20% off with any Cloud Hosting annual webhosting plan. Sign Up Today!